Some know him as Ziggy Stardust. Others call him the Thin White Duke. 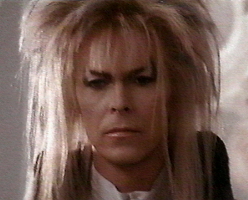 Though as Cinecultist watched David Bowie take the Central Park Summerstage last night with the Arcade Fire as a part of CMJ, we couldn't help but think of him as that guy who freaked us out in Labyrinth. ('Member Labyrinth? Young Jennifer Connelly? '80s New Wave Bowie? Muppets? Awesomeness? Yeah, sure you do.) But maybe that's because it was really tough to see the stage. We think perhaps everyone got taller somehow during the encore. Anyhow, despite the need to hop up and down to get a glimpse of his white suit, it was pretty damn exciting. For a little more of a visual recounting, check Lawrence's photos via Flickr.